The Old Bank Hotel is directly opposite the city’s historic Covered Food Market. 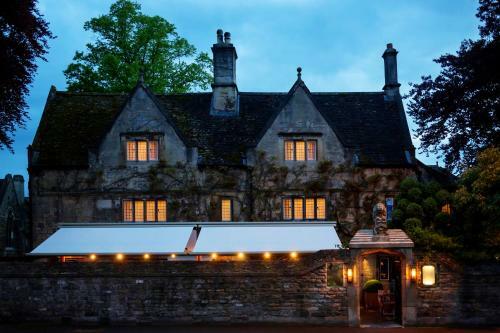 Surrounded by the famous colleges of Merton, All Souls and Christ Church, its popular Quod restaurant is a prime choice for Foodie Travellers in search of Afternoon Tea in Oxford. With its central location, gorgeous rooms and buzzing restaurant, this converted bank now one of Oxford’s top boutique hotels, comes highly recommended by us. It’s the perfect base for exploring foodie Oxford and for enjoying delicious food and drink. Lewis Carroll, the writer of Alice’s Adventures in Wonderland, held a bank account at Parsons Thompson which once occupied this magnificent Georgian building. Visitors to Oxford staying in the hotel are just a few minutes away from Christ Church college where you can take a tour and then sit down to your own Mad Hatter’s Tea Party. In fact, the hotel is the perfect base to explore all of Oxford’s foodie treasures. There are 42 luxury bedrooms some of which have wonderful views of Oxford’s famous landmarks such as the Radcliffe Camera. Expect marble bathrooms, contemporary furnishings, plenty of artwork on the walls and home made biscuits too. The hotel is independently owned by Jeremy Mogford and some of the food including the beef, comes directly from his local Rofford farm. There’s a set breakfast menu with different options including a ‘Morning Pick Me Up’ drink (have a Bloody Mary or a glass of champagne). If you’re in a hurry, you can pick up one of their handy ‘Breakfast Boxes’. The restaurant is very popular with locals, staff are friendly, the food is delicious and it buzzes with atmosphere. Come in the afternoon and treat yourself to a Graduation Afternoon Tea or on a Sunday evening, for their live jazz. Local beer comes from the XT Brewery in nearby Long Crendon. Aspiring food writers should check out the hotel’s website for details of the Jeremy Mogford Prize for Food and Drink Writing. The annual short story competition is run by the Oxford Literary Festival in association with Oxford Gastronomica, part of the Oxford School of Hospitality Management at Oxford Brookes University. The Old Parsonage is a boutique hotel in central Oxford set in a building dating back to 1660. Rooms from £179 a night. Sadly, they tell me that pets are not allowed.